Scotland’s venerable Battlefield Band has been playing great Scottish and Irish music since their formation in 1970, and they are just embarking on their latest tour of North America. Unlike some Rock and Roll bands who have become sad caricatures of themselves, they have stayed to the forefront of traditional music. They have pretty much seamlessly pulled it off with the timely changing of personnel, not always an easy or satisfying feat to accomplish. I first saw them in the early nineteen eighties at the home of Clark and Elaine Weissman in Tarzana, who in my estimation did more to promote this kind of music in Southern California than did all the Scottish and Irish cultural organizations put together at the time. The Weissman’s also hosted Silly Wizard, Ossian, and the Tannahill Weavers, among others. To say that I was blown away, is a serious understatement, as I really thought that I had died and gone to musical Heaven! I subsequently saw then at McCabe’s in Santa Monica, the Barn at U.C. Riverside and Cal Tech in Pasadena and always enjoyed them. The Battlefield Band, named for an area in the South of Glasgow, has had a great deal of lineup changes since their founding, and their list of alumni reads like a who’s who of great Scottish and Irish musicians. I have a sneaking suspicion that some of the current line up were just a gleam in their parent’s eyes, when the band first hit the road. 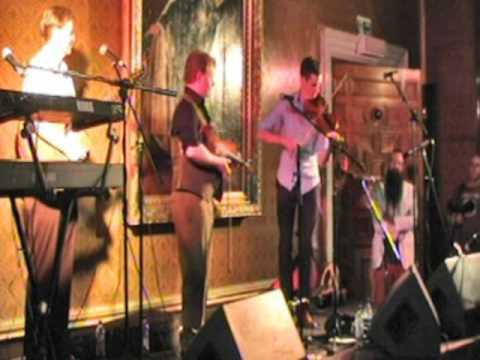 The current musicians are Sean O’Donnell (vocals, guitar), Ewen Henderson (fiddle, bagpipes, whistles, piano, and vocals), Alasdair White (fiddle, tin whistle, banjo, bouzouki, Highland bagpipes, small pipes, and bodhran), Mike Katz (Highland bagpipes, small pipes, various whistles, bass guitar, and guitar). A swift piece of arithmetic comes up with around twenty instruments, which must be no fun for their roadie! They are currently beginning their umpteenth tour of the States, which will include AMSD Concerts in San Diego on the 24th of March, Ojai Women’s Club on the 27th and Freight and Salvage in Berkeley on the 28th. If you have seen them before, then you will know that they are the real deal (or make that the reel deal), and if you haven’t, then you are in for a treat. 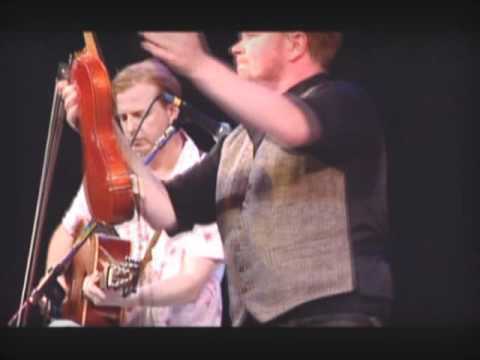 From frenetic jigs and reels to traditional (and not so traditional songs, such as O.V. Wright’s hit That’s How Strong My Love Is (made famous by Otis Redding). The tunes and songs continue to sound fresh, and you get the feeling that they are really enjoying themselves. Their somewhat different version of Creedence Clearwater Revival’s Bad Moon Rising will always be a classic for me! I had a really interesting conversation on the 9th of March with Robin Morton, who has managed and produced them since the early days. Robin was an original member of the Boys of the Lough, so he has a very good pedigree in this particular field. It was somewhat surreal, as he was in New York, and I was in the Scottish Highlands. We talked about the current economy and its effect on musicians in general. We also discussed the current line up, and talked about the early days. In this current climate of the internet, there is a whole world of information at your fingertips, so look them up, see what they are about, and attend one of their concerts near you. You will not regret it. Battlefield Band's latest record Room Enough For All was released in the USA on the 19th March, by Temple Records. Ron Young had the good fortune to grow up in rural Scotland, surrounded by the traditions of Scottish music and dance. He would like readers to know that whatever you heard about that sheep, it’s not true. Ron has spent the better part of thirty years involved with various Celtic and Scottish cultural organizations in southern California, and now back in Aberfeldy where he has continued to pursue his love of traditional music.